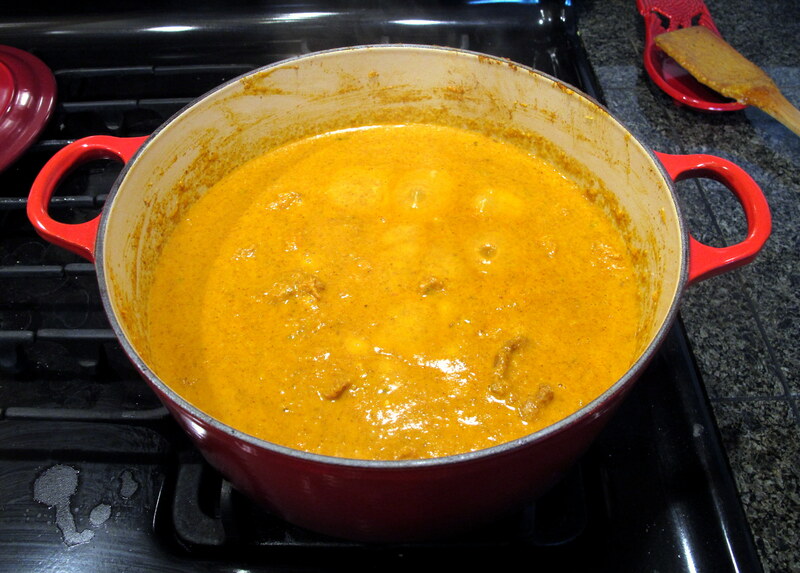 When Ev’s little brother was staying with us over his summer school holidays (our winter), both he and Ev became a tad obsessed with butter chicken. They even had a song for it. I can understand why, it is delicious but unfortunately it does take a little planning to get this meal made as the chicken has to marinate overnight and the sauce is better if made ahead of time, as well. 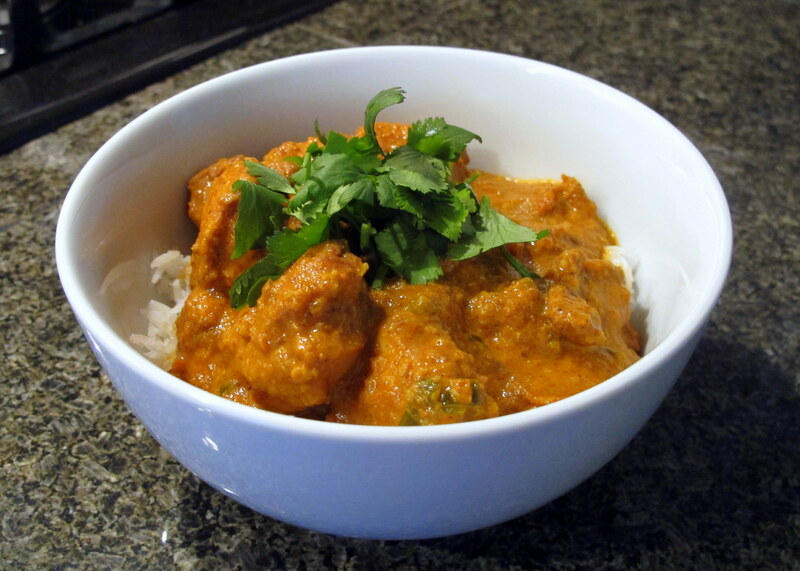 The original recipe is from a great YouTube channel called Eat East Indian. I highly recommend it if you are comfortable tinkering with recipes to FODMAP-ify them, as they have some delicious creations. I have made their recipe FODMAP friendly for all of you to try, with some other alterations as well – but of course I credit them with the amazing original recipe. Just a note – I made a double batch below, so that’s why the amounts look so much bigger. 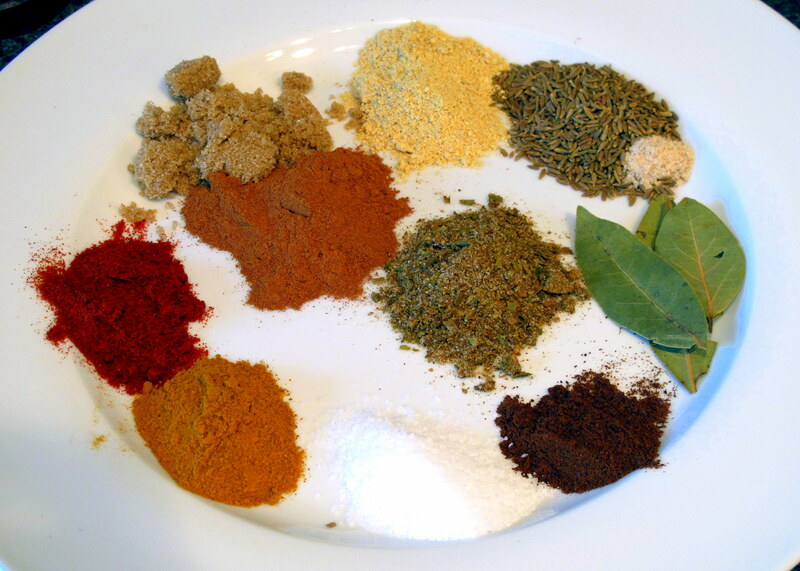 Garam masala can contain onion or garlic powder – it’s only a fraction of the 1/2 tsp. called for in this recipe so it might be tolerated by some. Use your own judgement and omit it if necessary. An onion is called for in the original recipe. 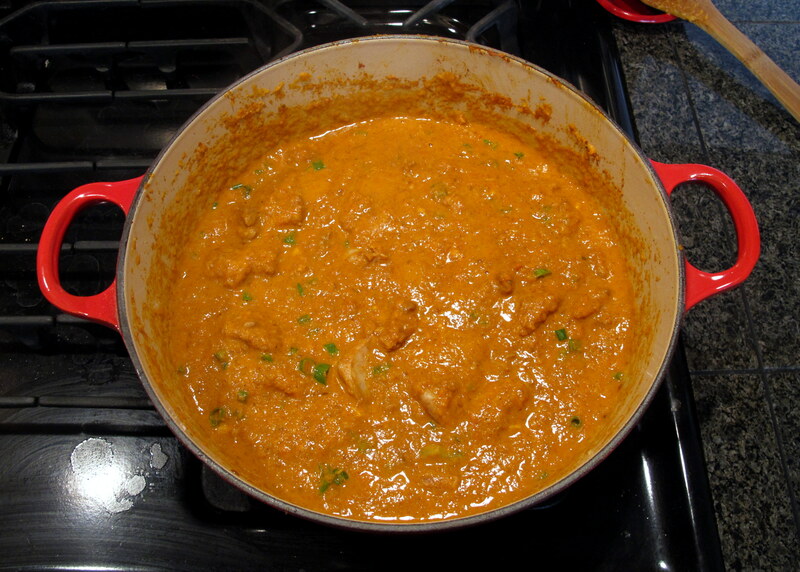 I have replaced this with a pinch of asafoetida powder and 1/2 a cup of green chives but you could go back to the original version if you can tolerate onion. Make sure your asafoetida powder is cut with rice flour and not wheat (to prevent clumping) if you’re very sensitive to fructans or a coeliac. Butter isn’t high in lactose, as lactose is water soluble and most of it goes into buttermilk instead of the butter – however you could replace some or all of it with coconut butter. The cream and plain yoghurt can be replaced with lactose free versions if required. Combine the spices with the plain yoghurt (lactose free or normal) and then mix through the chicken pieces. Place everything in an airtight container in the fridge for at least 1 hour – overnight is best. If you want the spice flavours to come through more strongly at the end, or if you cannot get LF yoghurt, omit the yoghurt. 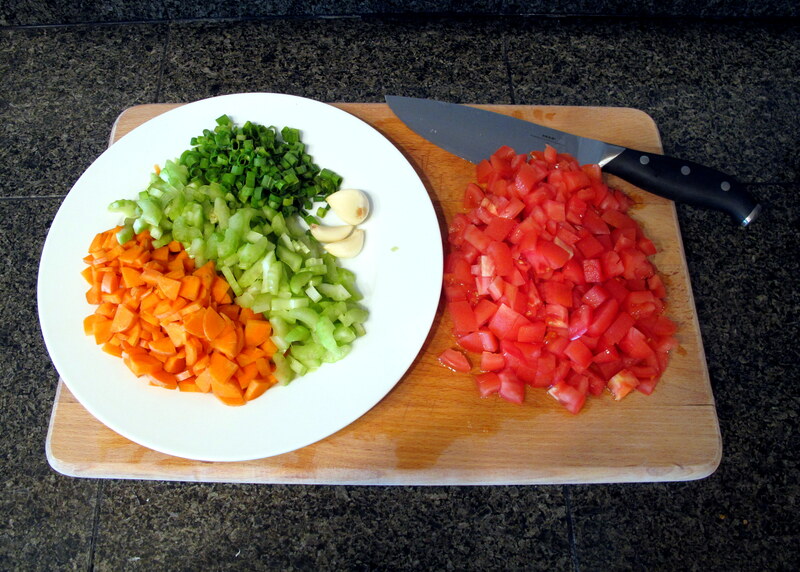 Prepare all your ingredients for part 2 beforehand; this makes the actual cooking process as simple as possible. 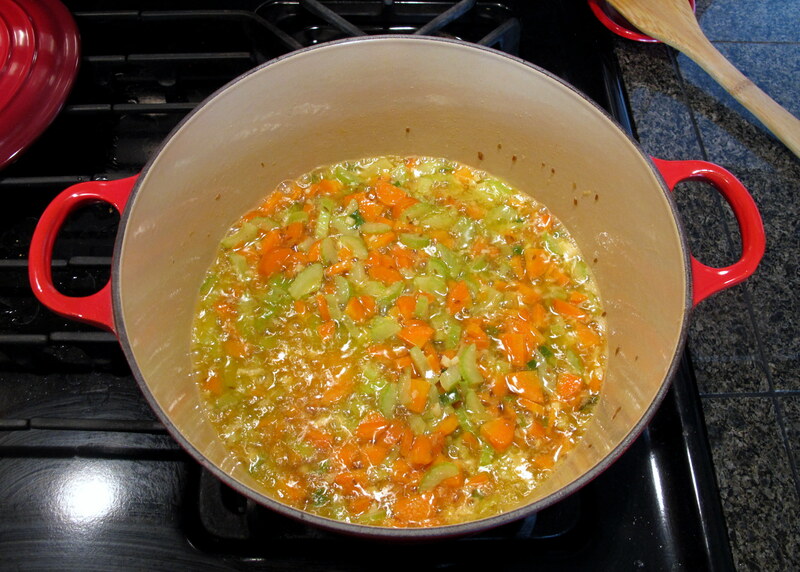 Gently melt the butter over a low heat and add in the cumin seeds and asafoetida powder; simmer until fragrant, then add the diced carrots, celery, garlic and ginger and simmer for 10 minutes with the lid on. The carrots need to soften before they are blended. If you chose to include a diced onion, add it in with the carrots etc. Next, add in the tomatoes and cook for a further 3 minutes. Pick out the garlic cloves and spoon the contents of your pot into a blender (or use your immersion blender and then set the paste aside in a bowl – but there’s no way I’m doing that in my Le Creuset!) and puree the vegetables. The paste will be used as the sauce later on. This step can be done on the same day as part 3 but the flavours can really mingle if you make it ahead of time, such as the night before when you start your chicken marinating. Seal your pot and fry the bay leaves and ground cloves until fragrant. Take your chicken pieces that have been marinating – the longer, the better – and add them in; sear until fully sealed. Remove the bay leaves and pour in the paste. 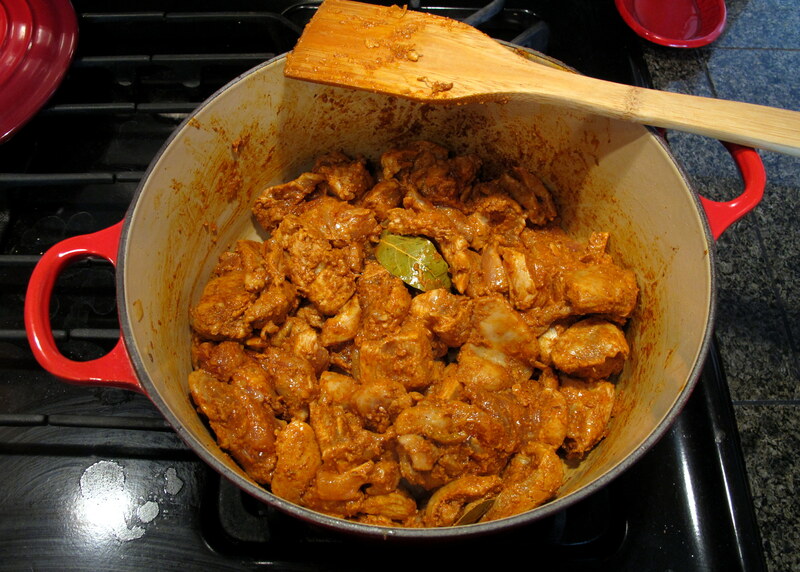 Mix well, then add in the salt, turmeric, paprika, brown sugar, cinnamon and chives and simmer for 30 minutes. 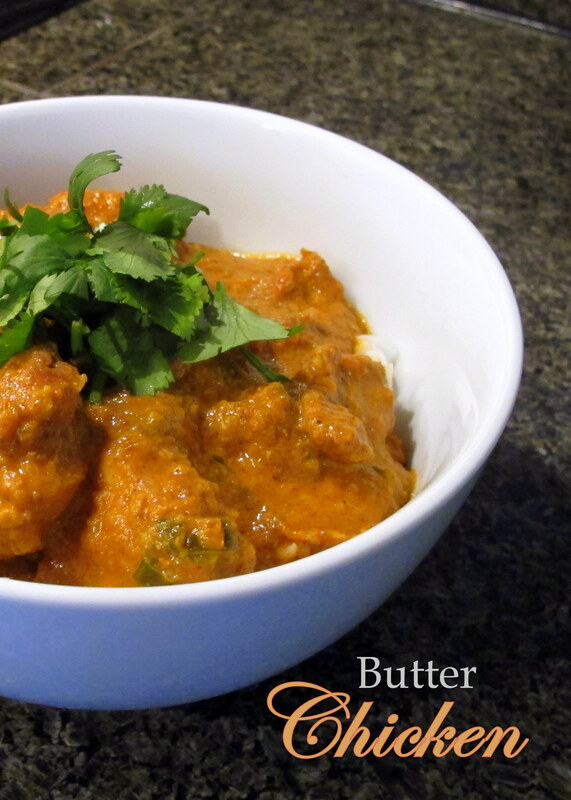 Pour in the double cream and cook over a medium heat for 5 more minutes before adding in the fenugreek seeds, black pepper and garam masala; simmer for 10 minutes and it’s finished. Some recipes might call for a drop or two of red food colouring but really, I think it’s bright enough as it is and why add in something that is completely unnecessary if it’s only going to make it a little brighter? 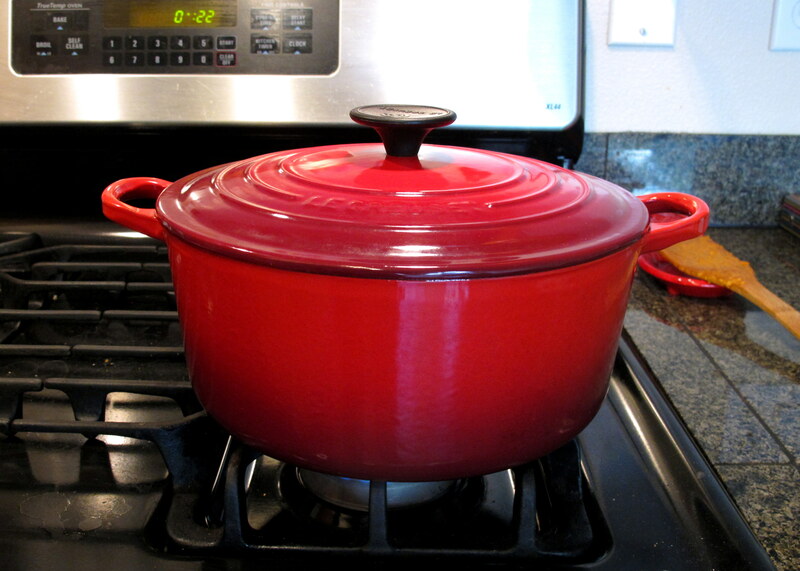 If you are not serving it straight away, keep it on a low heat until it’s required. 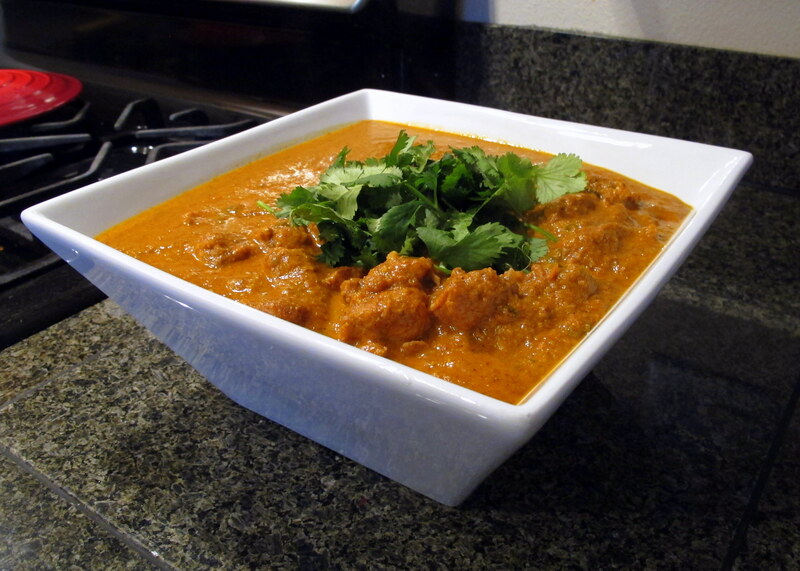 Serve with white rice and a garnish of coriander leaves (cilantro). You can serve the sauce and rice in separate dishes or create individual bowls – separately is more traditional but you can do whatever you’d like. 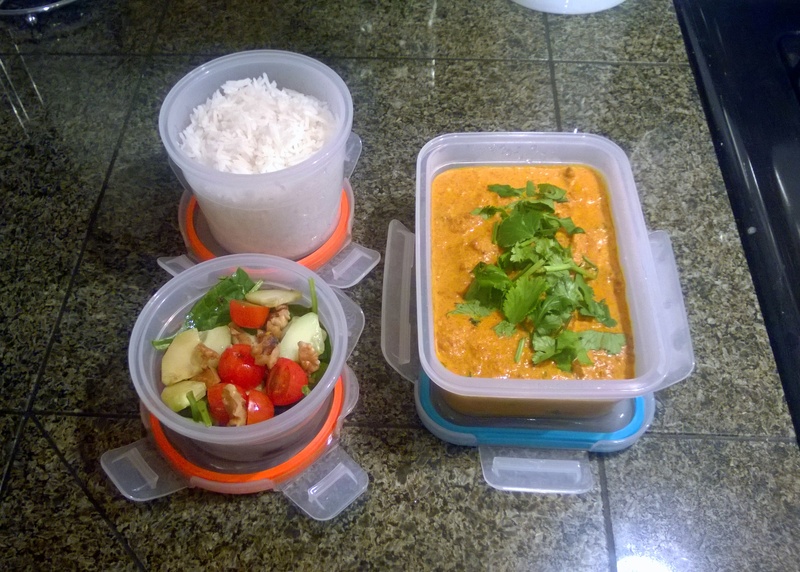 It makes a delicious lunch if you store it in individual dishes that you can either refrigerate or freeze and take to work/school/wherever for the week. Yesterday I went into Pike Place Market to (and don’t laugh at me here) take Bailey to see the city we’ve moved to. I know he’s a dog and all but I figured that we had dragged him literally half-way around the world and he hadn’t seen Seattle yet. It’s been 2 years. Plus it was a gorgeous day and who needs more of an excuse than that to go into Seattle to the markets and Fisherman’s Wharf? As you can see, we visited the markets and a few shops besides; Bails and Nellie were not only allowed in basically all of the stores that didn’t serve food but they also were given a treat in each one. Spoilt things. Seattle really is very dog friendly. Except for Sound Transit (a bus company) – for some reason dogs have to be crated to go on their buses, whereas King County Metro (the other bus company) has no rules other than you have to pay for a dog that won’t fit on your lap and one big dog per bus… just so you know. Anyway, back to the Asafoetida, also known as Hing. It is an interesting spice, to say the least. 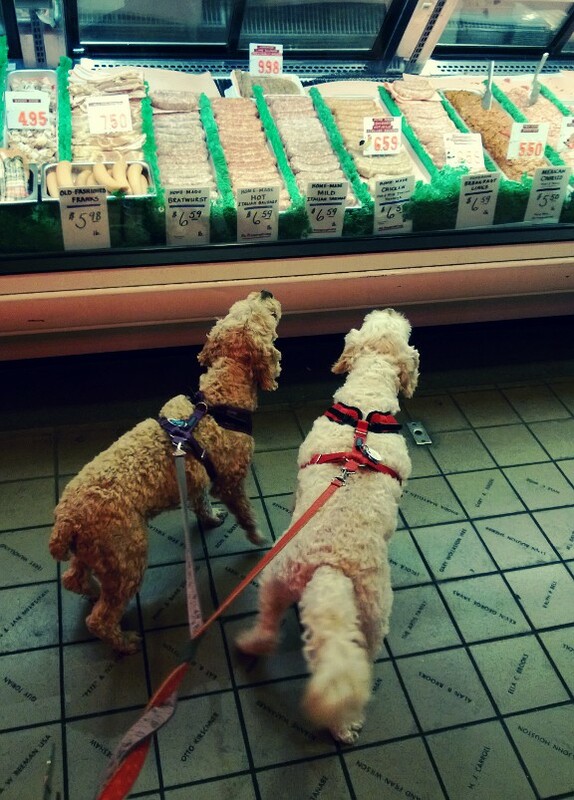 We visited the World Spice Merchants store, which is just behind Pike Place Market – again, the dogs were allowed in and were given treats – and while browsing, the words “onion and garlic flavours hiding within” popped out at me. This was exciting! While I can eat cooked onion and garlic with no issues, I am always looking for replacements to either put with my recipes here or just in case my FM changes and onions and garlic end up on my no-go list. *Note* After further research on asafoetida, the powder is usually cut with a tiny amount of rice or wheat flour to prevent clumping. 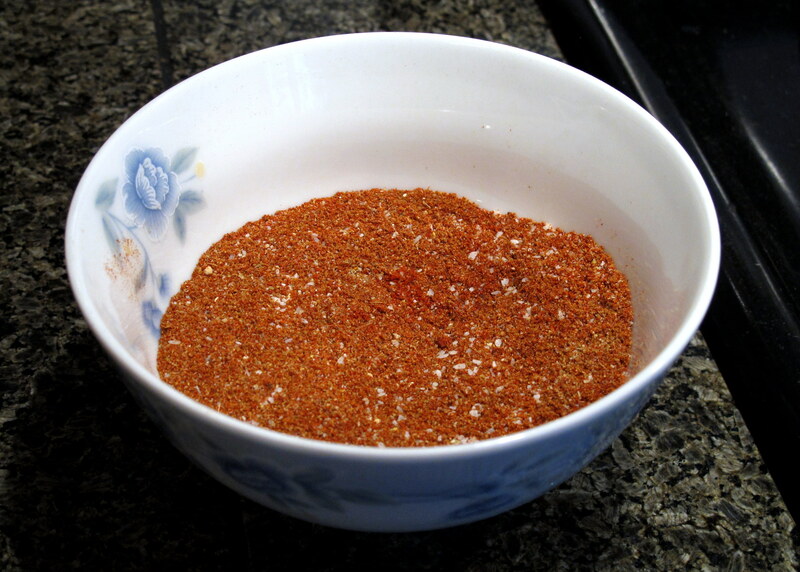 I emailed World Spice Market and their current batch (as of May 2013) contains wheat. If you’ve just got FM, this might be ok for you as you only use a pinch in any recipe; if you have Coeliacs, make sure you find a powder with rice flour only. Asafoetida is made from the sap excreted from the stem and roots of the giant fennel plant, Ferula Assafoetida, which is dried and then ground into a powder. It cannot be eaten raw, as it can cause severe gastrointestinal upset. It is very popular as a spice in Indian cuisine as well as soups and stews, due to the onion/garlic/leek taste (as well as a truffle flavour) that it can bring to a dish. It apparently pairs well with cauliflower and legumes. There can be side effects to Asafoetida, though. Apparently, it is quite efficacious with regards to flavour, so not much is required – it has the nickname “Devil’s Dung” due to its pungent odour when uncooked. I don’t think it smells as bad as that – at least the version that I bought doesn’t; it’s a bit like a strong onion powder smell. Due to its potential contraceptive effects, it is recommended that women who are aiming to become pregnant, are pregnant or breast-feeding do not consume this spice as it could cause a miscarriage. It should also not be consumed by young children. On that scary note, I’m going to experiment with it as a flavour enhancer in a few dishes, without intending to use it medicinally. 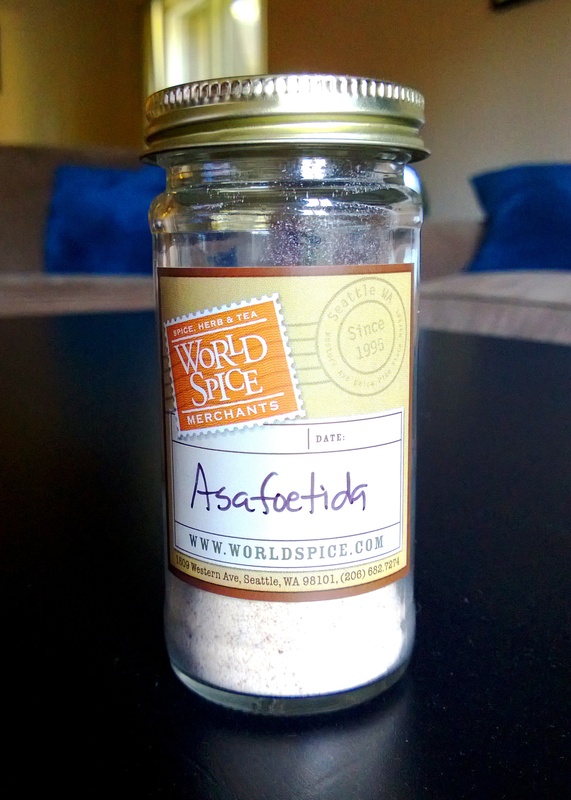 Does anybody else out there have any experience cooking with Asafoetida? I’d love to get some recommendations.